A rare and early Empire period six light "Sac a Perles" chandelier circa 1805. From the very fine cast main central ring which support the branches , chains of graduated almond shaped drops are run to a smaller ring . 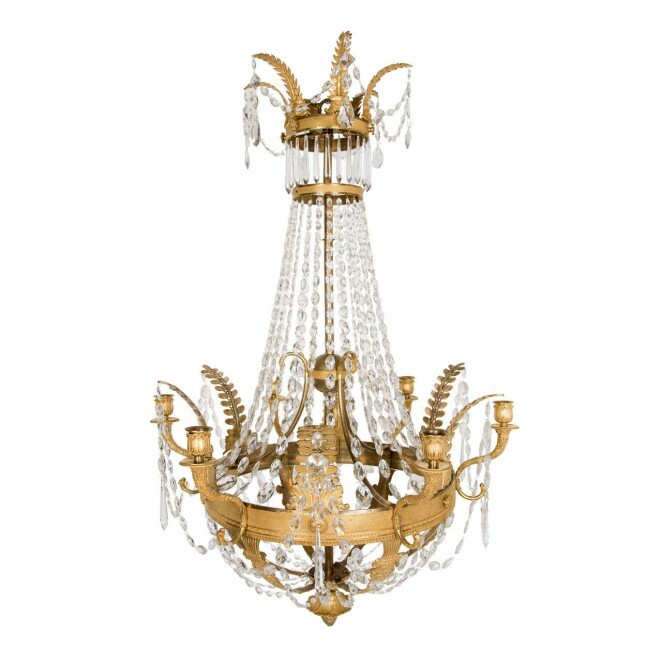 The very fine cast, Cornuppia-form branches with the round drip pans and Arcanthus shape candle holders and the bay leaf shape ornaments connecting each other by chains of almond shaped drops, are typical for this style. Under the crown a row of icicle prisms is hung, also typical for this period. Another beautiful feature of this chandelier are the little panther heads at the end of every arm and the three central structure arms inside the ring. All the seperate ornaments are numbered by corresponding dots which is a feature for authenticity. More detailed description on request.